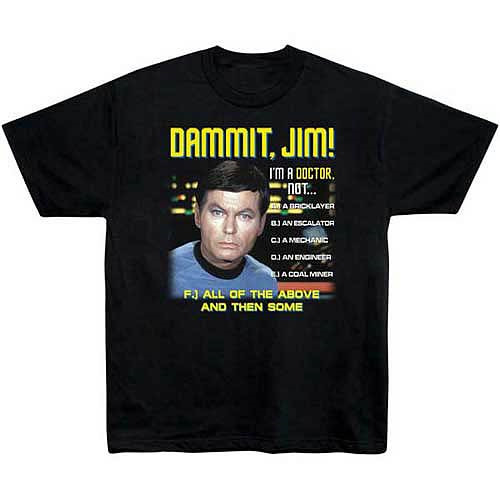 Star Trek All of the Above McCoy T-Shirt. Everyone knows that Leonard "Bones" McCoy is a doctor, but in case you were wondering-- he's also NOT many things. Learn all about it with this 100% cotton, high-quality, pre-shrunk, black Star Trek T-Shirt. Machine washable. Order yours today! Shirt says: "DAMMIT, JIM! I'm a Doctor, not... A.) A Bricklayer, B.) An Escalator, C.) A Mechanic, D.) An Engineer, E.) A Coal Miner, F.) All of the Above and Then Some"